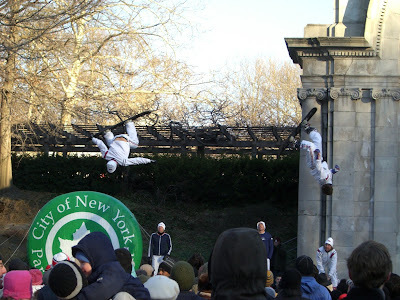 Greetings- just a heads up that I'm now a regular contributor over at Metroblogging NYC. I've included an applet down in the right hand column -----------that's this way people--------------> so you can see the last 10 posts I've made over there. Good stuff. I'm also an occasional contributor to Bathrooms of the World- look for a new post from me there within the next few days! So check 'em out..but be sure to come back. The sudden death of Anna Nicole Smith still has the city reeling in shock. You can't walk a block without coming across a makeshift memorial. The local supermarkets are even having sales on jugs of milk as a tribute. And then there's the folks over in this Park Slope building in apartment #2 who have taken it the next level; barricading themselves inside for a mourning period while publicly hoping that her memory may be a blessing. The question is- is the sign an invitation to come in and join them or a warning to keep out? Where Does the Black Stuff on the Snow Go? 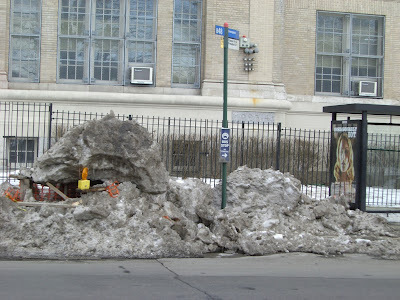 Well it's finally warmed up enough to melt off most of the snow, but what happens to the layer of black crud on top of the snow? The snow turns to water and goes down the sewer and flows into the ocean killing off marine life with it's layer of sewage, chicken bones, and oil but where does the black stuff go? Does it just pile up in place until it rains? Does it flow to the ocean? These are the probing questions we need to asking in this time of warming because Barbara "soft focus" Walters sure as hell ain't asking them. Here's a few shots I took of Trinity Cemetery last week when the snow was fresh. 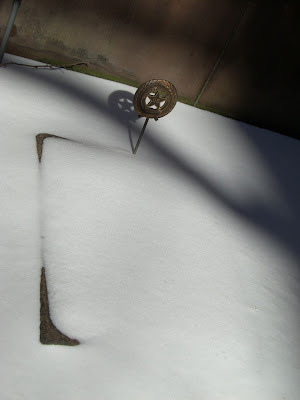 The first is a Revolutionary War veteran's grave, covered in smooth snow. Using the finder at the Trinity Church website, I believe this may be the grave of Francis Lewis, a signer of the Declaration of Independence but probably best known today as the namesake of a major road in eastern Queens. The second is an old old old worn down tombstone surrounded by chunks of snow. They, like many of the stones at Trinity, are weathered beyond all recognition. These are likely from the 18th century. 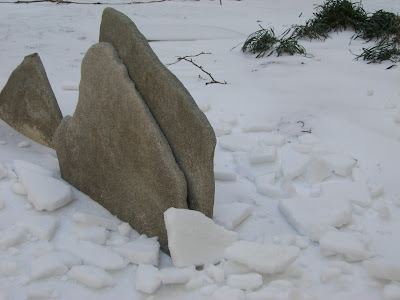 By tomorrow the snow will be gone but the stones will remain to see another day. 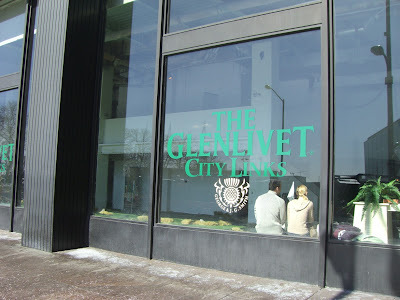 The Glenlivet City Links course is back! 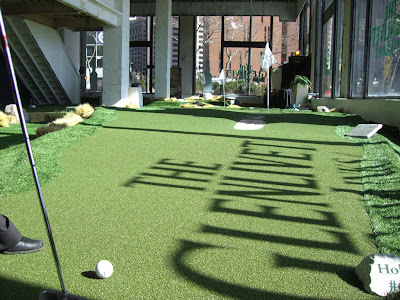 Glenlivet, the scotch whisky makers, have set up a free 9 hole minigolf course downtown. 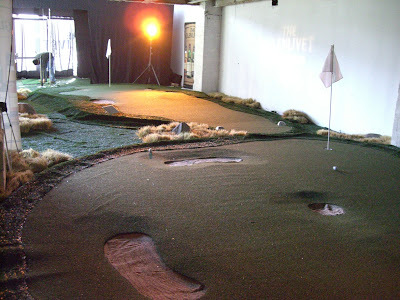 Housed on the ground floor of a non-descript black windowed office building, the course is a fake grassy respite from the big hair orange tanned hustle and bustle of the nearby Staten Island Ferry terminal. The par 3 course is actually pretty difficult- the greens are long (for miniature golf anyway) and they have sandtraps and undulations. One hole even has a water hazard. No windmills or loop de loops here. 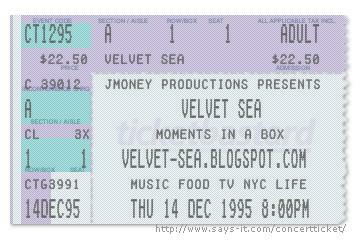 Unfortunately, they were not giving out any free Glenlivet, so no getting loopdy looped either. The city links course is only open for one more day- tomorrow from 11-2:30p at the corner of Whitehall and State Street before moving on to Atlanta, Houston, Denver, San Francisco and Philadelphia. It only takes about 20 minutes to play and is a lot of fun, so stop by on your lunch hour. Whole wheat sourdough bread slices topped with olive and parsley tapenade and fresh feta cheese. Italian wedding soup with meatloaf chunks instead of meatballs and homemade spicy whole wheat sourdough croutons. Steak three ways- spicy pepper, red wine, and terriyaki style. Chocolate soy milk rice pudding. The parsley olive tapenade was awesome and quick to make; I simply blended a handful of olives, some parsley, a clove of garlic, a bit of salt and ground pepper, with a squirt of lemon juice. Went very well with the whole wheat sourdough and feta I had picked up at the farmer's market on Sunday. For the Italian wedding soup, I used a box of chicken stock, cut up a bunch of baby carrots and red potatoes, and more of the parsley. I substituted leftover meatloaf for meatballs and slowly stirred in a fork whisked egg. Adding in a few dried spices from the rack- celery salt, a dash of black pepper, sea salt, and chopped bay leaves, before letting it simmer on low for several hours. To make the croutons, I tossed the bread chunks in some olive oil and black pepper and baked for 15 minutes. The result was hearty and flavorful. The steak was pretty good; I just sliced it up into 3 and marinated each one separated, but the soup was so filling that I probably did not need such a heavy main course. And by heavy main course, I am talking literally. I definitely did not need to buy a 3.25 lb sirloin for 2 people. Note to self: next time tell the butcher an actual poundage amount and not "cut it about an inch thick" or you will end up eating steak leftovers for the next three weeks. The chocolate soy milk rice pudding was a disaster- I think I did not cook the rice long enough to let it soften. I boiled brown rice in chocolate soy milk and then added sugar, salt, vanilla extract, and topped it with cinnamon and nutmeg. Flavorwise it was good but texturewise it need to be much much softer. I think I can still save it by adding more soy milk and microwaving it a bit. Overall, despite a few small wrong turns, it was a successful meal and much better than sitting in some overcrowded restaurant. 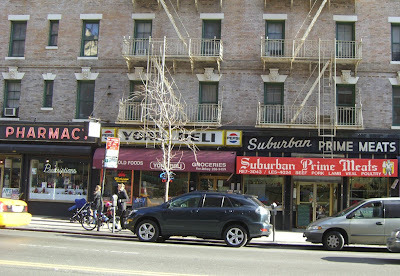 A nice row of 3 stores and 5 signs on York Avenue. You can tell the bottom Suburban sign is old because it starts the phone number with 2 letters and has no area code. Good times, fun stuff, I'll be back again next year too. 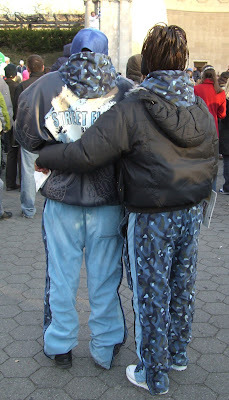 How cold is it out there? 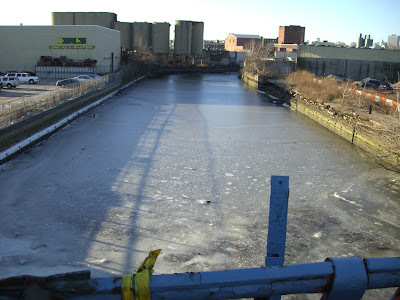 Break out the ice skates cause it's cold enough to freeze over the Gowanus Canal (or at least a portion of it). Who knew that 150 years worth of oil, mercury, PCB's, and lead could actually freeze? That vacant looking lot on the right is the future sight of the Gowanus Whole Foods, pending removal of the toxic soil, btw. In the 1850's it was a very popular tourist attraction, drawing over 500,000 people a year to it's nearly 500 acres. 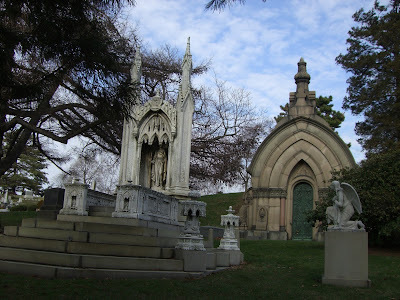 Walking through the hilly cemetery today is more than just a stroll through uniform blocks of granite in the ground, it is a stroll through monuments of grandiose individuality. 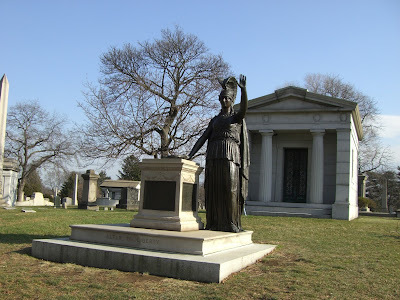 Green-Wood is non-denominational and is the final resting place of a large number of famous people including: Leonard Bernstein, Jean-Michel Basquiat, Bill "the butcher" Poole, Louis Comfort Tiffany, Margaret Sanger, Boss Tweed, Currier and Ives, Henry Ward Beecher, DeWitt Clinton, Samuel FB Morse, Edward R. Murrow, F.A.O. Schwarz, Henry Steinway, as well as many many others. Attempting to find those graves is like trying to find a needle in a haystack; I'd recommend going on a tour or getting a guidebook if you're looking for the big names. 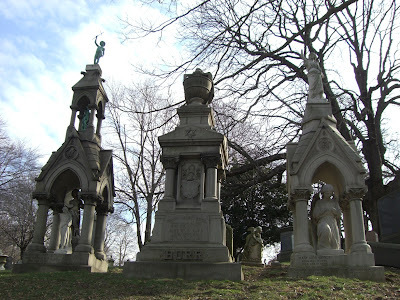 Even without seeing it's famous residents, a walk through the cemetery is rewarding. Here is the statue of Minerva, the "altar to liberty" at the top of Battle Hill. 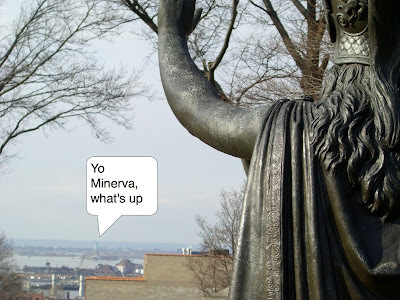 Minerva is situated on the highest hill in Brooklyn and is saluting Lady Liberty herself. The hill is named for the Battle of Brooklyn, where George Washington was forced to retreat from the British in one of the first major battles of the Revolutionary War. 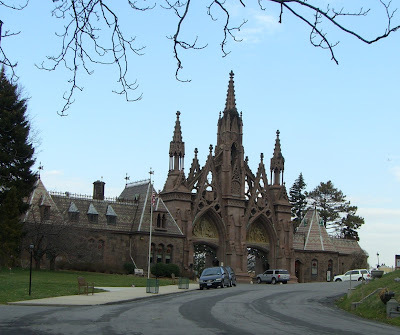 If it ever warms up again, Green-Wood Cemetery is a great place to spend an afternoon (or an eternity). Foyckme. 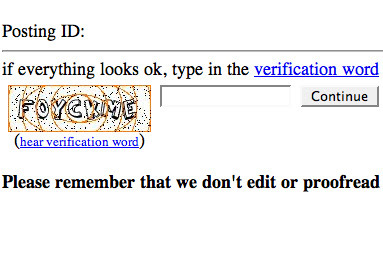 No- Foyck You. File that one under humor, jokes, funny, hilarious and mildly retarded.